Born in 1972, I was five when Star Wars [no, not “A New Hope”] hit theaters, where I saw it like most everyone else on the planet, at that time. Stating I was blown away is a bit of an understatement. 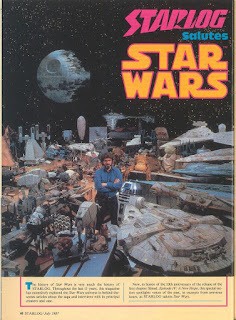 From the “Holiday Special” to the action figures to the trading cards and the storybook adaptations, I was all in. 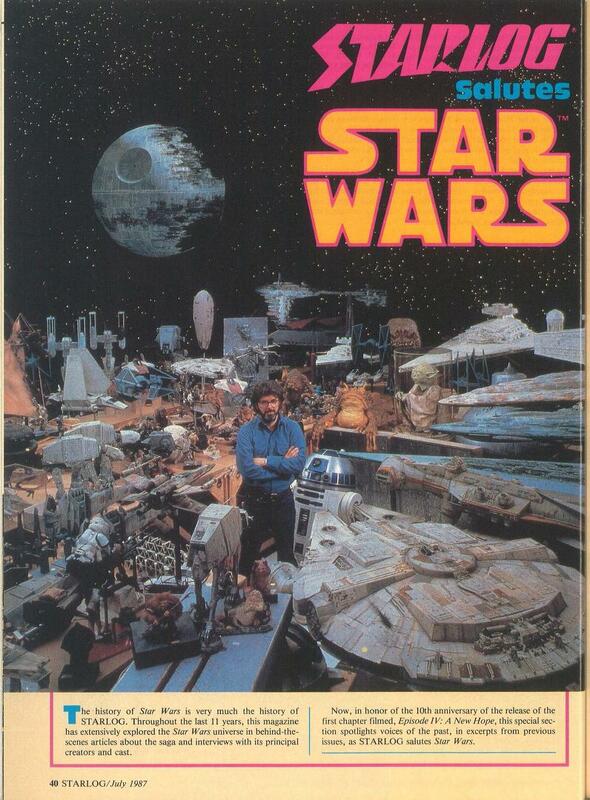 That trilogy – the only Star Wars trilogy, to my mind – was the be-all and end-all for many, many years. 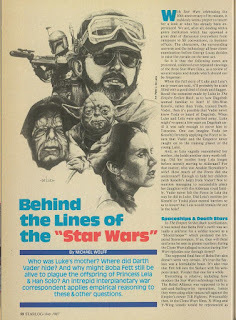 It’s now December, 2015, and we are barely weeks away from the new Star Wars film, “The Force Awakens.” All signs point to this will be good, and with all the excitement surrounding this new chapter, my mind has trailed back to some of my fondest Star Wars memories. Here’s one . . . 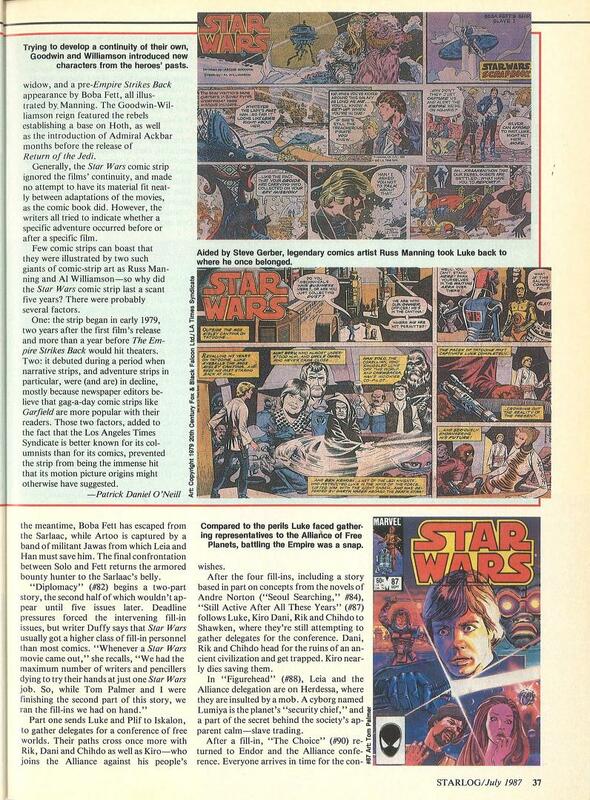 In 1987, Star Wars was celebrating its 10th anniversary and Starlog magazine its 11th. Which meant it was a perfect time for an over-sized issue of that seminal science fiction magazine—a 100-page Science Fiction Spectacular! 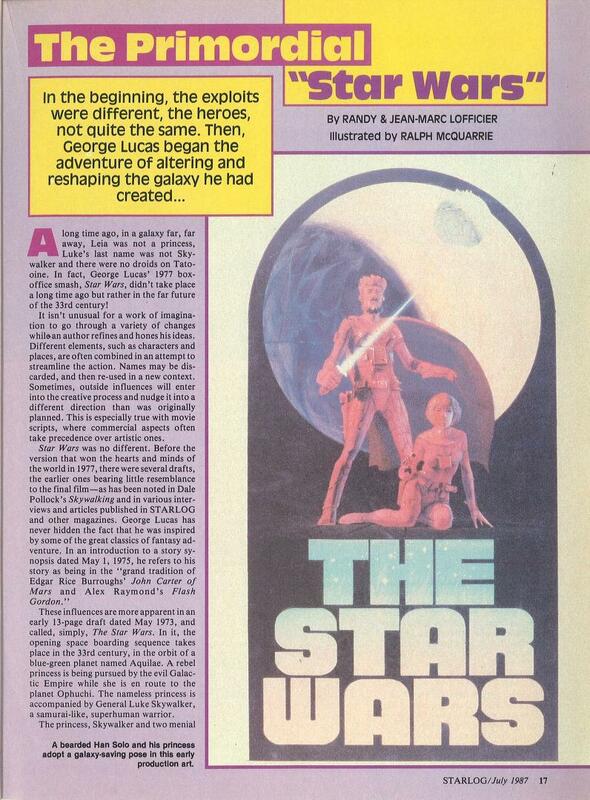 · A look at the original treatments for Star Wars and how things evolved by Randy & Jean-Marc Lofficier. 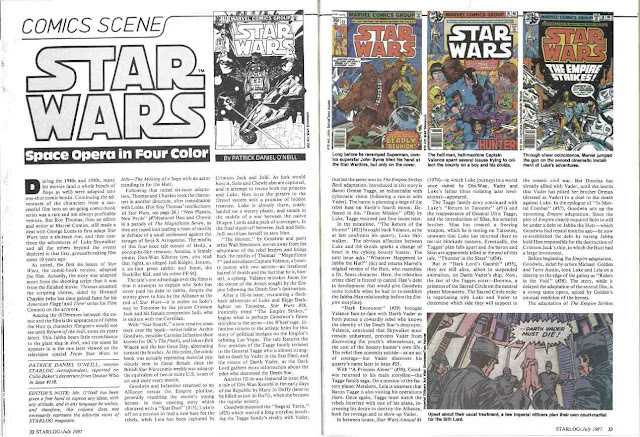 · Roy Thomas’s reminiscences of taking on the scripting of the Star Wars comic, before the film was released, and then expanding on what George Lucas had created. 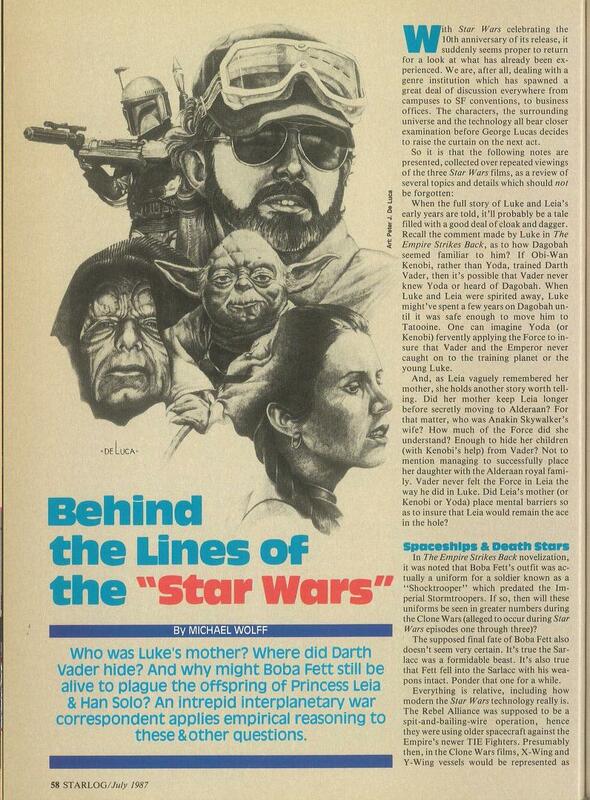 o Luke’s comment that there was “something familiar” about Dagobah. Did he spend a few of his early years on the swamp planet? o Leia claiming to remember her mother. Did she keep Leia with her for a time, before giving her up the Bail Organa? 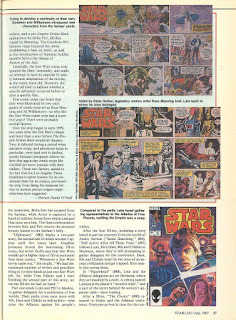 o What were the Clone Wars? o What was C-3PO hiding in Star Wars claiming ignorance of Princess Leia when we first see her holographic message projected by R2-D2, despite stating in the opening scene, “there’ll be no escape for the Princess this time,” when the Tantive IV is under attack? There’s a ton of great stuff in this issue for all Star Wars fans, and the memory of discovering it on the magazine racks at Mr. Paperback, buying it, and racing home to read it is one of many that I cherish from my childhood. 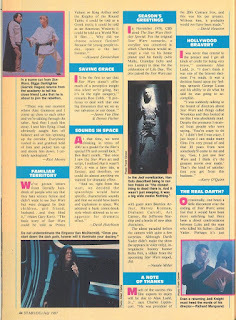 And if you want to check this issue out, it’s completely free here. Glad you liked the article. I had fun writing it. It's stayed with me for almost thirty years. 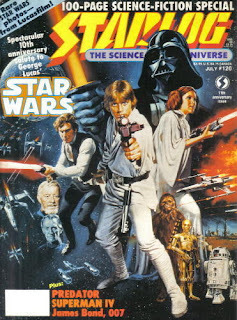 Yeah, it had a big impact on my Star Wars-focused brain. Thanks for reaching out. 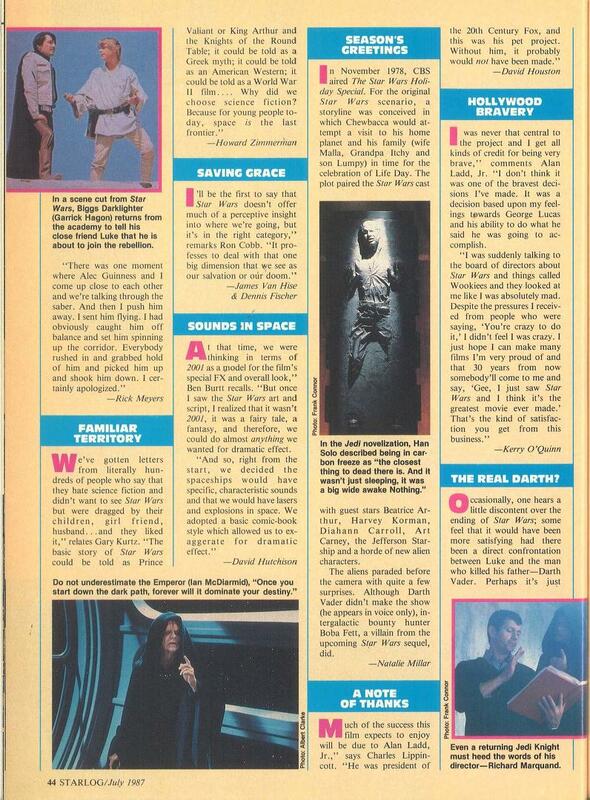 ANTICIPATING NEW STAR WARS: The Sears Wish Book!